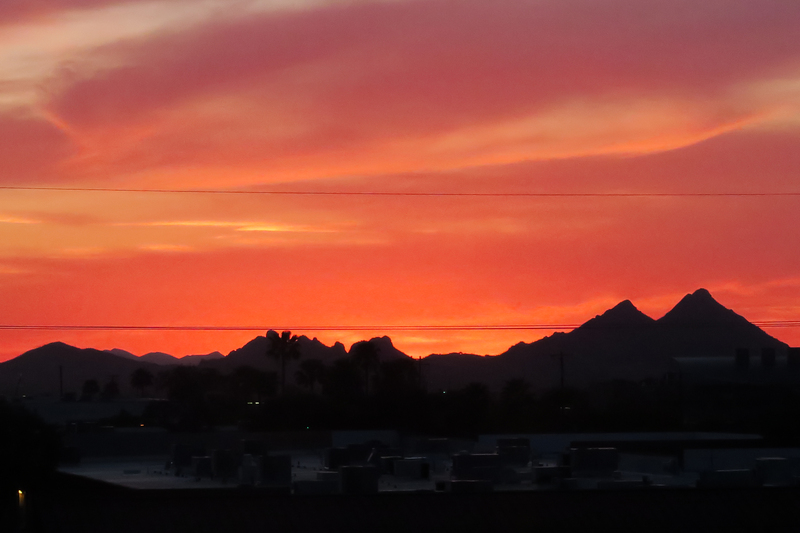 Above: Sunset over Tucson in March, through a hotel window. So what have I been up to during the past two months? Well, quite a lot actually. I spent February and March on a detail (temporary work re-assignment for those not familiar with government-ese) to the USFS Southwestern Region in Albuquerque, NM. I’ll say that even after two months there, I still have to stop and think about how to spell Albuquerque. My time there was kind of mixed… I had a great time learning a challenging job (I was the acting Regional Aviation Safety Manager) that ties in perfectly with my passion and skill sets, and I got to work with some great people. But I also had some not-so-good experiences while I was there… I got sick with the worst upper respiratory bug I’ve ever had, which knocked me out of commission for the better part of two weeks; I came up short on yet another attempt to get a helicopter job back in Montana; my truck was broken into and some miscreants stole a pair of hiking boots and a work coat out of the covered (and locked) back; and my parents had to put down one of the family dogs while I was there. Sad to say, I was not a real happy camper for a good part of my time in Albuquerque, despite it being an amazing opportunity and experience professionally. 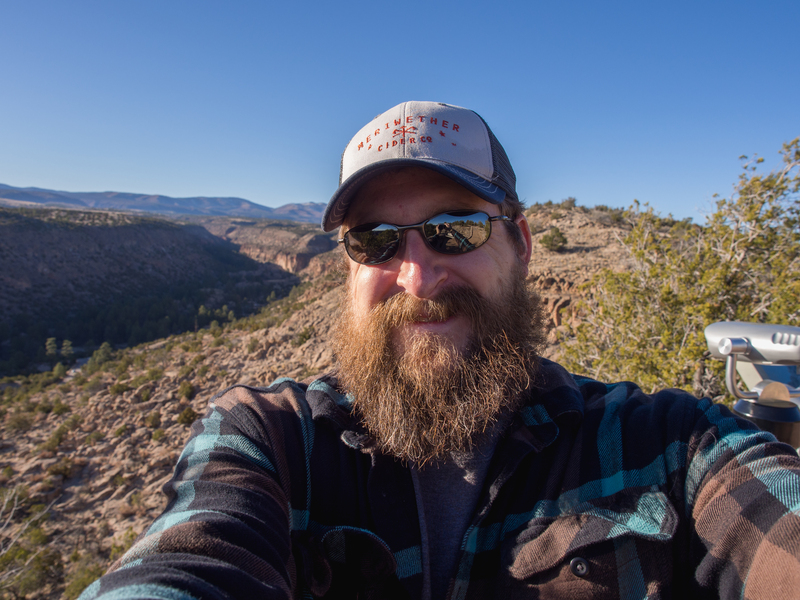 Above: Yours truly at Frijoles Canyon, Bandelier NM. While I was in AQB I managed to explore a little bit, when I wasn’t sick and stuck in a hotel room. I went up north and explored around Los Alamos and the Valles Caldera one weekend, and checked out Bandelier National Monument. I’ll freely admit that the forester/ecologist in me got a bit excited to be driving around at 8 or 9 thousand feet elevation and seeing the same tree species that I’d see at 3 or 4 thousand feet back in Idaho and Montana. I also made the short drive to the Sandia Crest (I was too cheap to pay for the tram ride), and saw the views from 10,600 feet at the top. I made in-town trips to the National Nuclear Museum, the ABQ zoo, the aquarium, and the botanical garden, which were all interesting in their own rights. I did my best to explore the town itself, although being a rural gringo, I wasn’t too keen on heading into the sketchier parts of town on my own, without a local guide. I can’t say as I enjoyed living in Albuquerque, as it’s an extremely rough town with a lot of crime, but at the same time I did develop an appreciation for the good things there. At the end of the day, I’m still a mountain boy from the Northwest, and the deserts of the Southwest, especially the urban communities, just don’t hold that much appeal for me. After my Albuquerque experience I went into a month-long whirlwind of travel for work, hitting Missoula for two different weeks, and Tucson and Denver for a week each. Needless to say, I was, and am, pretty close to being burnt out on travel, and it’s not even fire season yet. So far I’ve spent 67 nights on the road, and it’s looking like the roadshow for fire season is going to be starting very soon. I’ve only started to feel caught up in the past few days, after basically spending all of February, March, and April away from home. That, in a nutshell, has been my life the past few months… lots and lots of travel, and lots of work. I really haven’t had a lot of time or opportunity for photography, reading or writing, or even visiting with family. It’s been a challenging year so far, and I have no doubt that it will continue to be a challenge going forward. I also have no doubt that I’ll continue to power through it, taking one small step at a time to move forward. Thanks for sharing. I’m brand new to the Wildland Firefighter realm, and I’m anxiously waiting for my next dispatch (Pony was my first, and the long-distance relationship our crew had with the fire left me yearning for more)…eager to make a career from the glory that is this job. I look forward to new pictures and posts. Be well.